In stock - low quantity. Order in the next 1 hour, 14 minutes and it will go out today! Yes, you've been wanting it, you've been waiting for it even. It's Rich Hill's The Table the World Awaited ™ but even better!! Bring this beauty with you for your next performance and see what you've been missing! Put it together in less than 10 seconds and you're ready to go! 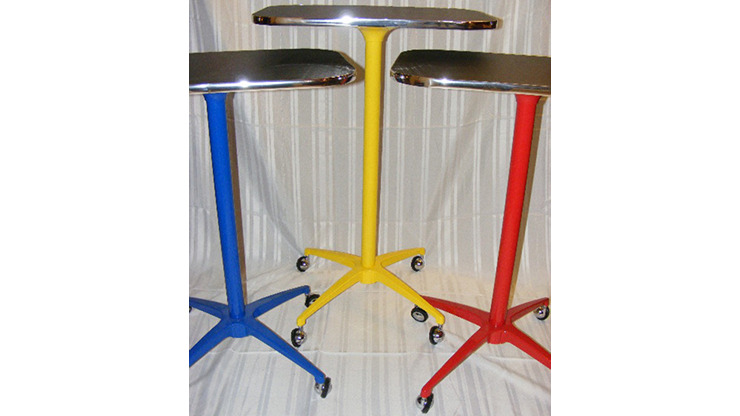 Available in a powder-coated finish or chrome, it's 32 3/4 inches high with a 16x24 top. And it moves with you silently on high-quality Shepard ball casters. It's a working magician's dream! Order yours today!